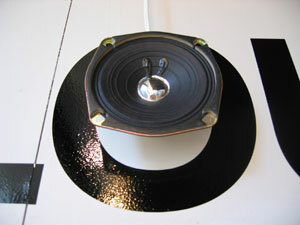 SpeakerPhone – 2002 | JONAH BRUCKER-COHEN, PH.D. 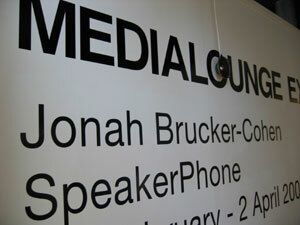 SpeakerPhone – 2002 – JONAH BRUCKER-COHEN, PH.D.
Uncovering the path and presence of sound across distance. 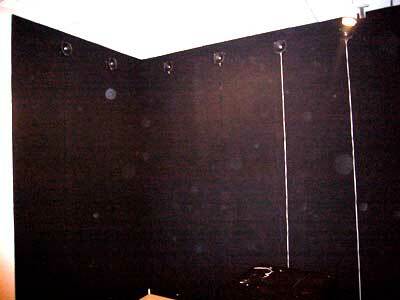 3D rendering of Install at Media Lab Europe, Dublin Ireland, 2002. SpeakerPhone is a sequence of individually addressable speakers that enable sound to be targeted instantly to a precise location and to travel along a path. The project enables a range of presence applications including the creation of highly customized spatial soundscapes and the transmission and layering of sound information across multiple locations in space or time. Telefonica Foundation Gallery, 11/17/07-12/24/07, Lima, Peru. OBORO, Montreal, Quebec, 9/16/06 – 10/21/06. The Media Centre, 2/19/04 – 4/6/04 @ Huddersfield, UK. UBICOMP 2002, Sept 28-Oct 1, 2002, Gotenborg, Sweden. 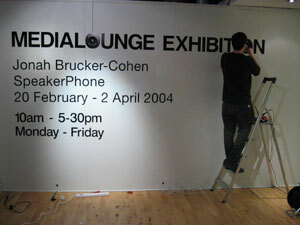 Video of Install at the MediaLounge in HuddersField, UK, 2/19/04 – 4/6/04. What is the path of data traveling through telephone lines, networks, electrical outlets and other concealed means? How do we bring this information out of the wires and into our environment? SpeakerPhone attempts to free information from these hidden pathways by liberating the data itself and releasing it into our surroundings. 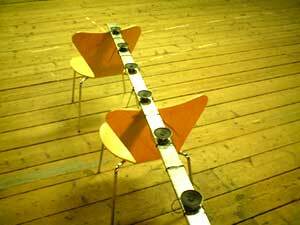 The original idea was that when someone speaks into the microphone, their voice is recorded and broadcast along the array of speakers with a time delay for each speaker in the sequence starting from the first speaker in the chain. The result is a tidal wave of sound that moves quickly from the beginning speaker through the intermediary speakers until it reaches the final speaker. The project consists of 24 speakers arranged in a rounded rectangle on the ceiling of the room. 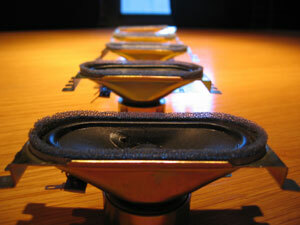 Each speaker has a specific number (1-24) which determines its role in the flow of information. 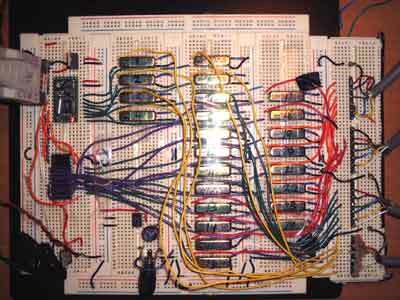 Sound is recorded on the computer and sent out the audio card into a main bus where a microcontroller controls an array of relays that address each individual speaker. 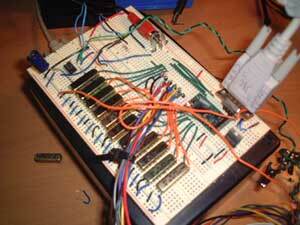 There is a 16 to 1 multiplexor chip that controls the relays. Scenarios for the use of SpeakerPhone include networked soundscapes, data spatialization, interactive narrative environments, and customizable sound landscapes. Below are a few specific examples of possible applications of the system. 1. 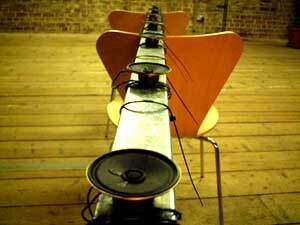 Data Visualization/Spatialization: Speakerphone uses sound as a means of exposing data moving through physical spaces. SpeakerPhone attempts to free information from the hidden pathways of wires. The movement of sound becomes an audible illustration of the information overload infiltrating our daily connected lives. 2. Networked Audio Mapping: When various necessities dictate our being separated from our friends, family, and colleagues, the need to maintain some kind of contact becomes more urgent. By creating a continuous two-way ambient auditory link between a pair of similar spaces through accurate sound layering, we can create a hybrid “connected” space. Such a scenario would require mirror arrays of microphones and sophisticated echo-cancellation technology. 3. Narrative Audio Targeting: Escaping the passive audience model, SpeakerPhone enables dynamic narrative sound applications and allows for a mobile relationship between audience and content in a story, presentation, or performance. The audience can help drive the narrative because their investment in the narrative becomes both physical and mental. 4. Smart Speakers: Like the Audio Spotlight, SpeakerPhone can focus audio on specific locations in a space and transform the audio landscape based on sensor feedback of various kinds. With further enhancement to the technology, individual speakers in the array could be made to sense their surroundings and create dynamic soundscapes based on their proximity to each other or other objects. 5. 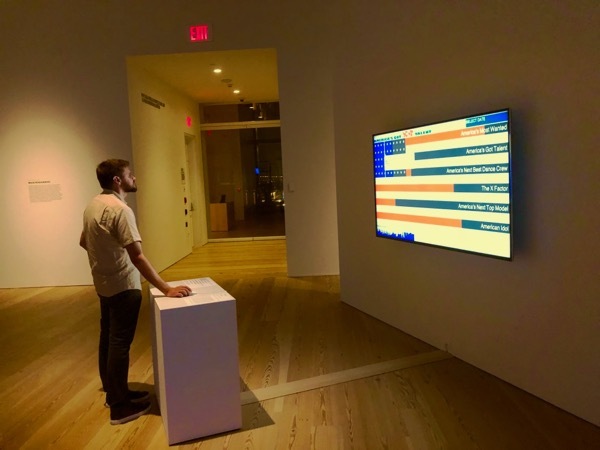 Telematic Audio Control: Remote networked control of audio placement would allow for collaborative audio environments created across distance by multiple performers or participants. 6. Pathways of Data: SpeakerPhone’s node-based architecture enables users of the system not only to dictate the final location of audio but also the path it travels to a specific destination. In this way, the system suggests the ability to customize the routes taken by other kinds of data in communications networks. Picture of SpeakerPhone installed at BLIP!, Lima, Peru, 11/17/07-12/24/07.